Grown for the flowers Delphinium plants are an erect perennial, from low growing ‘dwarf’ cultivars at around 20cm through to to 2m tall plants depending on species. The delphiniums grown most widely found for sale for the home garden are the taller growing varieties, these delphiniums require full sun with some shade from the hot afternoon sun, a moist humus rich soil and delphiniums may require staking. Flower colors are whites and blue, through to pink and deep pinks.Used widely in cottage garden borders we include Dowdeswell’s delphiniums from Tesselaar Bulbs. Delphiniums and ‘Larkspur’ are often confused, they are related, however ‘Larkspur’ are actually Consolida species. Delphiniums are perennials, Consolida are annuals. Delphinium plants like a moist humus rich soil and as with all soil preparation this is best done a few weeks before planting. Weed the area well and dig in some well rotted compost and cow manure, add a handful of blood and bone and dig over again. Leave for a few weeks and then you are ready to plant. Usually grown from seedlings or seeds, and are best planted out in early autumn, seeds can be sown in a cold frame to get a head start. Established plants can be divided as clumps expand, this is best done in late winter to early spring. Check the variety as some are taller growing than others and may be best planted further back in the border. Delphiniums are best planted where they get morning sun and afternoon shade. Prepare the soil before planting. We dig in some well rotted compost, aged cow manure and some blood and bone (bone meal). Dephiniums are hungry plants and dole fertiliser. A well drained soil is essential, so raise up the garden bed in damp soils. How far apart to plant Delphiniums is debatable. The closer they are are together, the taller they grow. Taller plants can be a little weak and fall over, however if you stake them they will survive. We plant them at around 70 cm apart and stake them with bamboo canes. Some growers plant them so that they grow through a wire mesh for support. We find the stakes are easier. Mulch around the plants to maintain a cool root run. After flowering, remove the spent flower head to just above the ground level. In winter cut them back to the ground. In spring as new growth appears, fertilise and water as required. Fertilize with with a liquid seaweed fertilise as well a ‘worm castings tea’ every two weeks. Plants can be cut back after flowering to encourage a second flush, although some growers think that this decreases flower vigor the next year. Taller growing cultivars may require plant supports. The main pests are snails and slugs especially with the small seedlings. Delphiniums do not like wet soil, they do not like hot soil, and do not like snails and slugs, so a well drained soil will help prevent rot over winter, mulch will keep the roots cool and sawdust will help keep the snails and slugs away. When do I plant Delphiniums ? Late winter to early spring, once the frosts are over. Seeds can be planted in a cold frame late winter. 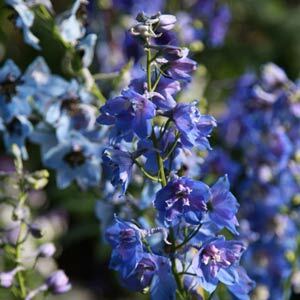 New Millennium Delphiniums, New Zealand Hybrid Delphiniums – photos, cultivation notes and the opportunity to buy seed for these glorious English hybrid type elatum delphiniums.